My love of the con is well documented at this point, but I also particularly love films that are mind games, and "The Spanish Prisoner" definitely falls into both categories. It's also from David Mamet, who is no slouch when it comes to these kinds of things. The spark of the story is simple - Joe has invented a formula, or a process, or, well, something. Something that a lot of people with a lot of money are willing to pay a lot of money for, because they think it will bring them even more money. From there, well, things get a little tricky, and I certainly wouldn't want to spoil the fun. I remember checking this movie out initially because it had two things I liked, a David Mamet con game and Steve Martin. 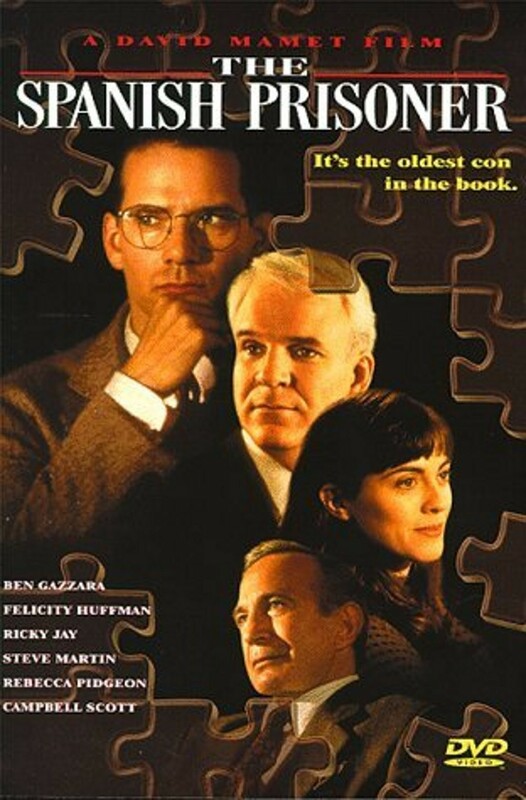 I'd been reading about Steve Martin saying how he was going to try things other than comedy, and "The Spanish Prisoner" was one of the first films I'd ever seen where he wasn't out for laughs, and he made an excellent player in one of Mamet's shell games played with Russian nesting dolls. He's quite lovely in this film, playing his film with just the perfect amount of inscrutability. And, of course, like most David Mamet films, it also features the wonderful Ricky Jay. Ricky Jay's done a ton of incredible things over the years, and I'm still annoyed there isn't a way to pick up the fantastic television special that Mamet directed called "Ricky Jay And His 52 Assistants." Ricky Jay, you see, is a slight-of-hand magician, and can do things with a deck of cards you simply wouldn't believe. Oh, you lucky people. While I was writing this, I decided to look and see, and sure enough, there's the whole special, free on YouTube. It's an amazing piece of sleight-of-hand and showmanship. He's playful, witty and a devilish raconteur. I've always wanted to see one of his shows live. Maybe some day. But there's a whole show for us all, on YouTube. The internet is a wonderful thing. Here it is, for when you have the time. Perhaps the only thing that I'm not particularly fond of in "The Spanish Prisoner" is the only thing that I'm not fond of in a lot of David Mamet's work - the acting of his wife, Rebecca Pidgeon, whose acting always feels overly stilted to me. I've seen her in a bunch of stuff he's done, and I always feel like whatever part she's playing would be better served by a different actress. Maybe it's just something about her delivery. She's fine, I just think there could be better. If "The Spanish Prisoner" appeals to you, there's a wealth of Mamet films you can get later, including "Heist" and the classic "House of Games." Mamet's also written a bunch of plays and movies that he hasn't directed, choosing simply only to scribe them, many of which are very good. You should look into them.